Do you miss sparkles? We do too. Most of us wore sparkles galore as youngsters, but those sparkles soon lost their shine as we got older. After all, when you get a big girl job and have to pay your own bills, there’s more and more pressure to look chic, sophisticated, and like an “adult.” Although we are happy to see the back of leg warmers and netted gloves, we do miss the glitter that used to brighten up our lives. Thankfully, we don’t have to give glitter up completely. Here are the best tips for adding sparkle to your wardrobe – the right way. You can thank us later. If you don’t have a blazer in your life, you need to go out right now and buy ten of them. They are the perfect addition to any closet, and they give you the chance to play around with smart, casual, and a whole host of colors. If you’re looking to add more sparkle to your wardrobe, a metallic sparkly blazer will instantly become your best friend. Metallic colors are always on trend, and a blazer will take your outfit from shabby to chic in a matter of seconds. The best part? The sparkle is real! Adding the right amount of sparkle to your outfit can seem challenging. Too little and you look drab and boring, but too much and you look like a shining glitter ball. That’s why you need to find the perfect glittery ratio for you – and this is where your little additions come in to play. Accessories make it easier than ever to add the right amount of sparkle to your outfit because you can chop and change what you are wearing. A necklace, bracelet, and set of earrings too much? Ditch one of them! Play around with your look until you’re truly happy. 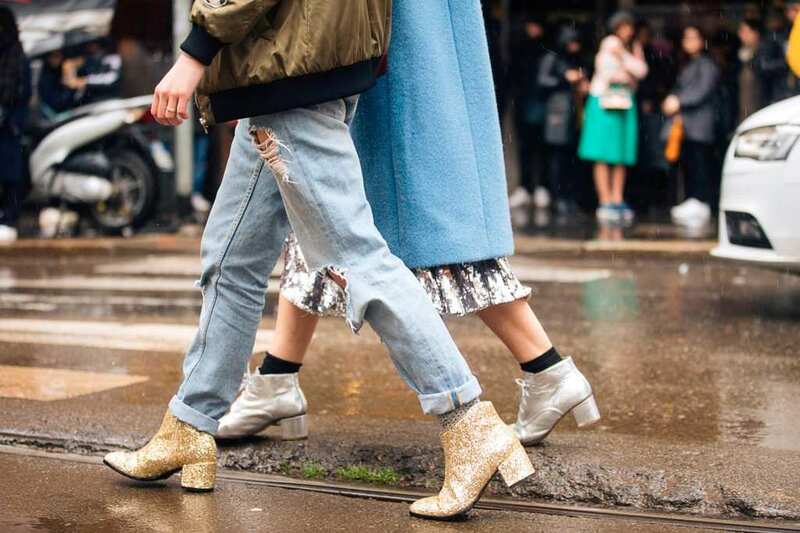 We know that these boots were made for walking, but what about those sparkles? If you want to add wear sparkles without wearing a glittery dress or a shimmering shirt, it’s time to invest in some sparkly shoes. Anyone can pull off a pair of sparkly shoes, and you really can pair them with anything. Team them up with an awesome jumpsuit, a show-stopping dress, or even your fanciest pair of jeans. The opportunities really are endless. If you’re the kind of person that wants to stand out from the crowd but doesn’t want to be the center of attention, you need to get the sparkle just right. One of the best ways to do this is to mix and match. Instead of going overboard with your sparkles, try to tone it down with another color or pattern. For example, rock your sparkly shirt, but match it with a matt black skirt to show a little variation. You want to shine, but you don’t want to blind the people you pass on the street. There’s nothing wrong with adding sparkle to your wardrobe; you just have to do it the right way!